This Sunday, show your gratitude to your lolo and lola by bringing them to the Araneta Center for a day of fun and bonding. This September 8, a special photo exhibit showcasing life's precious moments will be presented at the Making Memories exhibit. It will also include tips on how to strengthen brain power. The event will be made more unforgettable with a special performance by balladeer Chad Borja. The Binibining Pilipinas queens, Miss Universe Philippines 2013 Ariella Arida, Binibining Pilipinas-International 2013 Bea Rose Santiago, Binibining Pilipinas-Tourism 2013 Cindy Miranda, and Binibining PIlipinas 2013 1st Runner-up Pia Wurtzbach will also grace the opening of the Making Memories Photo Exhibit. 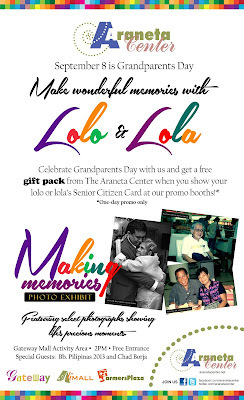 Your lolo and lola can get exciting freebies when they see the exhibit and dine at the Araneta Center. From September 6-8, they can also get a free Minute Maid drink or a special limited edition Coke Tin Tray, when they present a P150 minimum single receipt purchase from Gateway Food Express, Ali Mall Food Gallery, Farmers Food Plaza, and Dampa sa Farmers Market. Also, free Sudoku and Crossword Puzzle booklets are to be given away for free; just have your lolo or lola present their Senior Citizen card at the exhibit area on September 8 to get this special gift pack from the Araneta Center. Value your grandparents because they are a big part of your existence. The “Making Memories” exhibit will be at the Gateway Mall Activity Area for the whole month of September. For more updates on the latest events, shows, and developments at the Araneta Center, visit www.aranetacenter.net or like The Araneta Center on Facebook: www.facebook.com/AranetaCenter.